I received a bottle of Certified Organic Prairie Vodka for review, but was not compensated financially in any way. The opinions expressed are my own and are based solely on my experiences while recipe testing. Summer days mean warm delicious days. Swimming pools, beaches and lakes. Blenders making frozen drinks. Craving frozen lemonade on these perfectly sunny hot days. 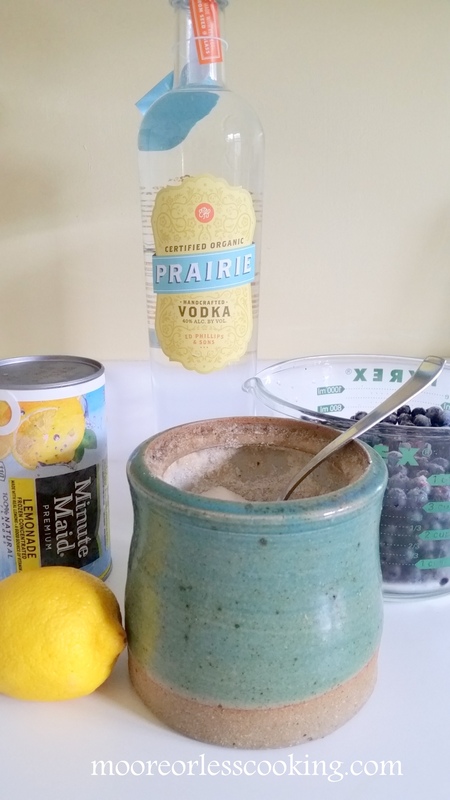 A tub of frozen blueberries in the freezer and stepping it up with Certified Organic Prairie Vodka makes the perfect summer cocktail! Sip this gorgeous drink slowly~ stay away from BRAINFREEZE!! I may have experienced something like that…. 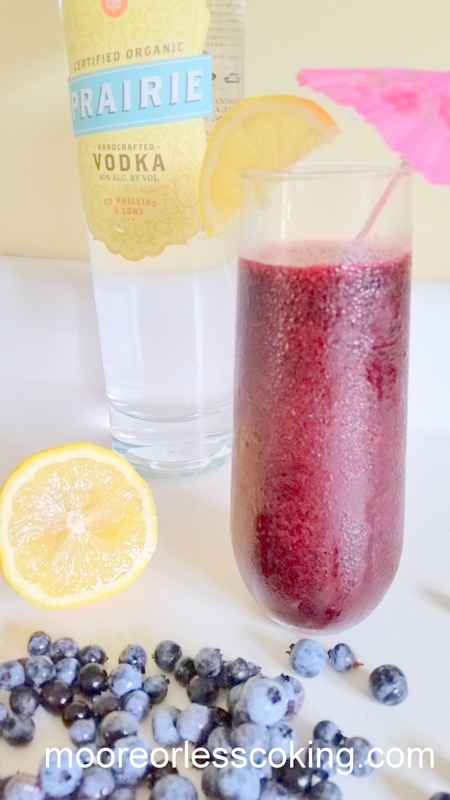 What you will need for this delicious cocktail: Frozen Blueberries, Frozen Concentrated Lemonade, sugar, Prairie Organic Vodka, Lemon for garnish. If using fresh blueberries, no worries: add ice. Place all of the ingredients in the blender, pour into your favorite glass and serve. Garnish with a slice of lemon and umbrella! Happy Summer! Prairie Organic Spirits offers 100% certified organic vodka, which is made from single vintage organic corn that gives Prairie Organic its award-winning flavor. Each bottle of Prairie Organic Spirits takes three years of meticulous work and provides an elevated cocktail experience that we can all raise a glass to. Their Motto is “Made with respect, from Seed to Glass”. The fifth-generation of family distillers who run the Phillips Distilling Company have turned a new, green page with the recent release of Prairie Organic Vodka. This corn-based vodka is certified organic and kosher. All of the corn used in Prairie is grown by a co-op of 900 farmers in and around Benson, Minnesota where the vodka is produced. From the corn to the stills to the bottling, Prairie is organic and has reduced the environmental impact of production significantly. Making a frozen cocktail couldn’t be easier, just add all of your ingredients into a blender. If making a beverage kid friendly or alcohol free just leave out the vodka. 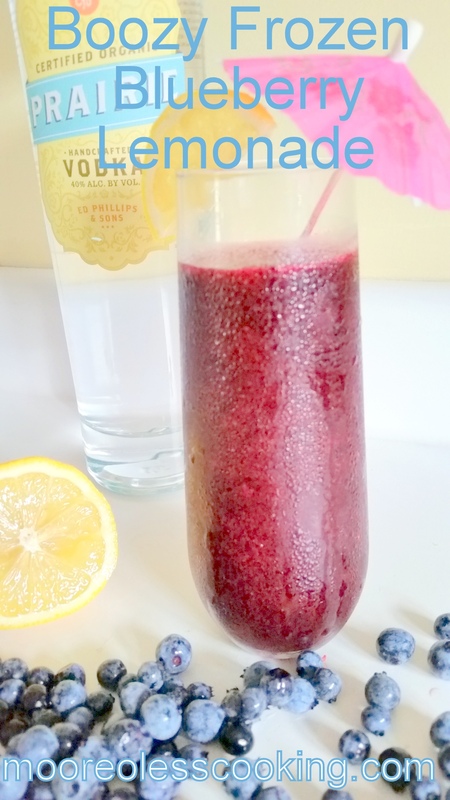 This Boozy Frozen Blueberry Lemonade is a refreshing combination of tart lemonade and sweet juicy blueberries, making it the ultimate summer entertaining beverage. Fill a blender with Blueberries, sugar, lemonade, and vodka. Add 2 cups of ice if using fresh blueberries. Blend until smooth. Pour into glasses and serve immediately. If desired, garnish with fresh lemon slices. What a fabulous, summertime cocktail Nettie! Pinned, yummed and stumbled. Hey is it noon yet? Must be somewhere! 😉 Looks fab!!! This drink looks right up my alley! Count me in, this looks amazing!! oh this sounds so nice and refreshing! And, I adore your sugar container as well! Sign me up to try some of these boozy lemonade using Prairie Vodka Nettie Pinned and shared! Looks so refreshing! Love it! I love blueberries. This will make a great drink for summer adult parties. I really like blueberry recipes.